Dental implanting is a great procedure, as it gives our patients a more permanent solution to their woes of missing teeth. The process begins with a consultation with one of our experienced doctors. That way, they will be able to assess your smile in its current state, as well as ask you about your long-term goals with regard to your smile. You will also have that opportunity to bring up any questions or concerns about the procedure, as we want you to be well-informed throughout the entire process.having a single tooth, or multiple teeth, missing, it can really affect the way you look at yourself and how you interact with others. Luckily, the doctors at Central Dental Associates understand the importance of having a full, beautiful smile, which is why they offer dental implants to their patients. 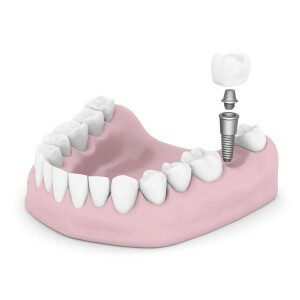 Getting dental implants involves imbedding a titanium screw into the jawbone. This implant will act as a new tooth root, and will prevent your other teeth from shifting to make up for the missing space. After the implant, the abutment is added, which is a support system for the implant and the crown. The crown is then placed on top, completing your new and beautiful smile! One of the obvious benefits to dental implants is the fact that they have the potential give back the confidence you may have lost feeling insecure about your smile. You will no longer have the fears you used to, such as meeting new people, joining your friends in a laugh, or making a memorable first impression. Another benefit is the fact that dental implants are the fact it saves the rest of your mouth from further destruction. When there is a tooth missing, the other teeth will begin to shift to make up for the missing space. With dental implants it eliminates that from happening! If you have any questions on how our doctors can help restore your smile via dental implants, call our office and make an appointment!